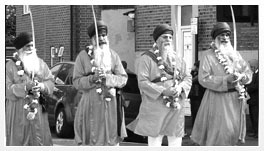 The Gurdwara teaches and practises the Sikh martial art Gata. Gatka originated in the Punjab region and was used by the Sikhs against the Mughal hukumat forces. Gatka is rarely used in combat today, and has evolved into a sport and exhibition form shown at Sikh festivals. Also teach the art of weaponry known as shastar vidiya. The Gatka classes are open to everyone over the age of five.